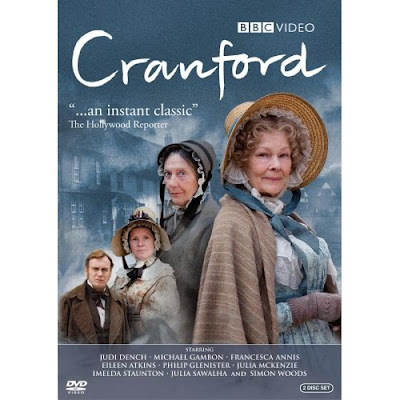 Having enjoyed Elizabeth Gaskell's Wives and Daughters, I was excited that Masterpiece Theatre was presenting another of her novels, Cranford. Well, last night was the last of a three part episode. It has an amazing cast of the who's who of British acting, Judi Dench and Eileen Atkins as the Jenkyns sisters Matilda and Deborah, Imelda Staunton as the nosey neighbor Ms. Pole, Michael Gambon as Mr. Holbrook, Francesca Annis as Lady Ludlow and Julia McKenzie as Mrs. Forrester just to name a few. It's a story about a typical English town in the 19th century and the lives and relationship of it's townsfolk. Being that it is a three part episode, you can tell that the story is intricate. New neighbors arrive and changes the lives and dynamics of the town. In addition, modernisation in the country blooms and start to threaten the Cranford community. With all these, the plot becomes very engaging and pulls the audience into the story. I found myself really involved with the story and the lives of the community. But what I loved most of all was the dialogue. It was so clever and incredibly funny. There were a lot of dry humor that only Brits can deliver. I was excessively diverted! If you missed it, all the episodes can be seen online at Masterpiece Theatre. The dvd is now also available at Amazon.com or Netflix.